The Humane Society of Huron Valley's (HSHV's) mission is to support the loving, responsible care of all animal's in our community by: *Ensuring proper, nurturing care for the animals in our shelter *Placing all adoptable animals in loving homes *Reducing pet over-population *Caring for the physical well-being of animals in our community *Providing education and outreach to the community Stopping animal cruelty HSHV offers a variety of services including pet adoption, low-cost spay/neuter clinic, emergency rescue, cruelty investigation and community education. Since 1896, the Humane Society of Huron Valley (HSHV) has been a leader in saving animals in our community. We are the only shelter in Washtenaw County, serving over 14,000 animals and their people every year. Thanks to innovative programs and community support (that is, thanks to VOLUNTEERS LIKE YOU! ), animals at HSHV do not have a time limit to get adopted, and HSHV is classified as a "no kill" shelter by Maddie's Fund, a leader in the no kill movement. Thanks in great part to volunteers, HSHV has won several awards for the highest save rate among all similar animal shelters in Michigan. HSHV provides a variety of services including animal adoption, affordable full-service veterinary clinic, spay/neuter services, low cost vaccine clinics, 24-hour injured animal rescue, humane education and youth programs, and pet lost & found services. Our volunteer opportunities for adults 18+ are many, and we have a junior varsity volunteer program for youth between the ages of 12-17. 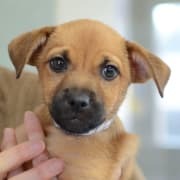 Would you recommend Humane Society of Huron Valley? I love HSHV! They have a great facility and offer many important services to the community. I believe they have the highest animal save rate in the state. Not only do they rescue companion animals and find them new homes, but they also offer important clinic services, pet food assistance, and educational info. I also think HSHV is a great place to volunteer. I've only been a volunteer for two weeks, but the program is extremely well-organized. Different volunteer levels and trainings ensure that you will only be doing work you're qualified to do. And there's a big range of volunteer jobs that you can try!